The Asia Pacific and Latin America market for sugar confectionary is prognosticated to grow at an unprecedented rate in the coming years, according to a report published by Transparency Market Research (TMR). The market comprises of strong players operating in emerging economies such as Japan, China, India and South Korea. The top five players in the APAC market for sugar confectionary hold over 50% of the total revenue in the market. These are Perfetti Van Mella SpA, Nestle S.A., Ferrero Group, The Hershey Co, and Mondelez International Inc. In the Latin America sugar confectionary market, the leading players are Mondelez, Mars, Arcor, and Nestle, with nearly 50% of the entire market share. With a recent surge in the demand for premium confectionary and chocolates, vendors are expected to focus on introduction of new products and widening their product portfolio. Acquisitions and partnerships are another key strategy to be adopted to vendors. 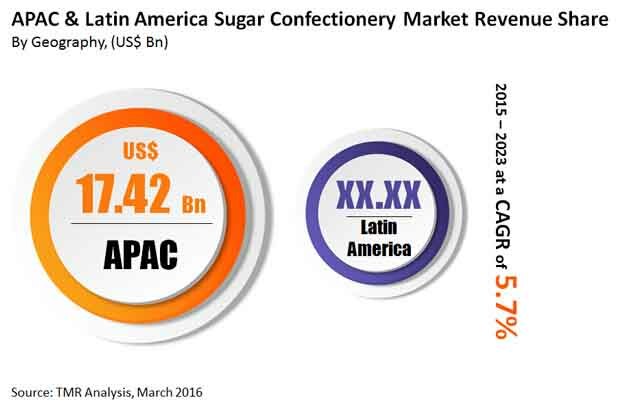 According to the report, the Asia Pacific and Latin America sugar confectionery market was estimated to be at US$26.1 bn in 2014, and is expected to rise to US$46.1 bn by 2023 with as steady CAGR of 5.7%. The sugar confectionery market is currently growing at a sound rate due to the high demand from middle-class consumers. The introduction of novel products with healthy ingredients and innovative flavors, rising popularity as a gifting item, and rise of the retail market are expected to drive the demand in the forthcoming years. Additionally, the growing disposable incomes of people in Asia Pacific and Latin American countries, and the booming population in emerging countries such as China and India is predicted to augment the market over the period of forecast. However, a few factors such as rising health awareness across the globe and surge in incidence of diabetes could hamper the sugar confectionery market growth to some extent. The consumption medicated sugar confectionery in Asia-Pacific is expected to increase, assisted by the growth in regional population, development in retail market, and stable economic growth. Medicated confectionery is widely used in the formulation of drugs for conditions such as cold, respiratory tract congestion, cough, and allergies. This segment is projected expand at a swift pace in the coming years owing to its wide product range, especially in children’s medications. The sugar confectionery market in China is supported by the steadily increasing purchasing power of the consumers and the rising use of confectionery as gifts on special occasions. While international companies have a strong presence in China, particularly in high-end markets, domestic brands much more cost efficient and as a result remain popular in rural areas. The growing aging population, and rising health consciousness are expected to influence the trajectory of the Japanese sugar confectionery market in present years. The Latin America sugar confectionery market, comprising Brazil, Argentina, and the rest of Latin America, has been strongly supported by the growing sugarcane industry. The innovation in sugar confectioneries has also enhanced the market in this region. The consumption of candy, pastilles, gum, and nougat is expected to increase as alternatives to chocolate and this trend has been driving local players to invest significantly in the sugar confectionary market in Latin America.